The way the dining table looks speaks a lot of meal to come. It also gently yet powerfully conveys the love and caring the meal preparer has placed in the presentation of the meal. This placemat and coaster designer collection opens up a world of design possibilities to help you set the scene and 'make the occasion' at your next celebration. These designer placemats are beautiful, durable and easy-care cork-backed placemats that are made in New Zealand using only the highest quality materials and offered in innovative designs and diverse themes and styles. Beautiful array of florals in unique colors and varieties that adds that extra flair, elegance and character to any dining table . . . Simply put - these are florals straight from New Zealand! More Floral designs - These are classic designs that will always be favorites. Collect a variety of floral placemats to match the changing seasons and changing party themes! Images of sea and its treasures that re-create the memories and past experiences you had with the sea.. A striking collection of ocean treasures that creates a summer mood. From the refined Classic Collection of Jason Placemats comes the Plains and Decoratives Range. 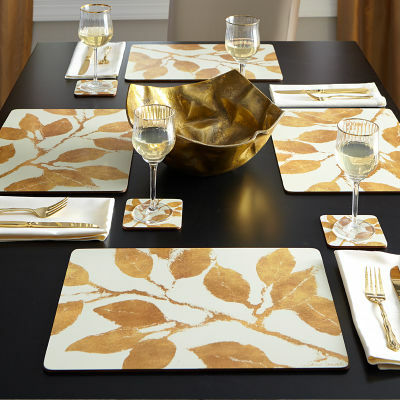 This collection adds another dimesion to our existing selection of superior quality placemats and coasters. This collection features all the condiments and familiar items found in the kitchen like oil bottles, pots and pans, fruits, baking utensils and the like. Landscapes, sceneries and places from all over the world! Thids range is a delightful detailed design depicting different scenes and landscapes in a variety of color palettes rich with all the colors of the world. An adorable collection of sceneries and landscapes that are breathtakingly beautiful. From traditional to contemporary, subtle to dramatic, whimsical to realistic, this collection is an ecletic mix of styles and taste.